Snaidero S100 kitchen on display, Italian design from the Snaidero Concept Store. Handles: No handles except of the KUBE handles for tall units. Worktop: 8cm corian in Bianco Artico (extra white) combined with inox. Sink: Stainless steel V50 type. Sizes tall units: 304.4 x 59 cm. Sizes island: 300.0 x 120 cm. 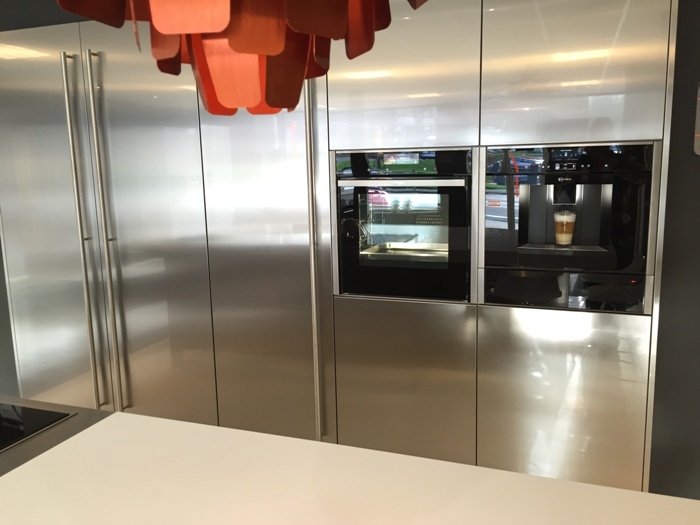 Very complete kitchen with Neff oven with integrated steamer, dishwarmer and integrated coffeemachine. Hob: Neff induction hob T66T61N0 double FLEX. Oven: Neff B48FT68N0 FullSteam oven with integrated steamer. Steam oven: Integrated in the oven. Tap: Fontana 40 (the version without LED light). The kitchen can be extended or adjusted with other integrated Neff appliances.